Puntos Necesarios: 1750 Tenga en cuenta que, de momento, no se puede descargar contenido de nuestra plataforma directamente en un dispositivo móvil (teléfono, iPod, iPad, tabletas ...). Necesitas descargar sus artículos en un PC o Mac y, a continuación, transferirlos a su dispositivo de forma normal. Estamos trabajando para permitir que las descargas directas a los dispositivos móviles, pero esto no es posible en la versión actual de la plataforma. Perdón por las molestias! NOTICE: Requires the base game Two Worlds II in order to play. Activation key must be used on a valid Steam account. Requires an internet connection. 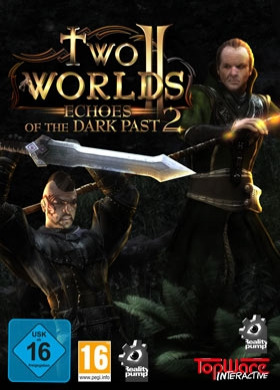 About the game	Your Two Worlds II multiplayer adventure continues in Echoes of the Dark Past 2: Three brand new domains await you, each with two unique paths, for a total of six never-before-seen maps to explore! Deep in the desert, a bloody c… onflict is brewing, and you must choose a side! Join either the Vanderbilt mercenaries or the Veneficus University expedition, each with their own unique quests, and unlock additional multiplayer maps depending on your choice! Key features Desert StormFight desert demons, hordes of the undead, and a crazed cannibal clan in the biggest Two Worlds II multiplayer map yet! The Tenebrae PassageJoin the crooked magician, Mendel, as you scour the old Tenebrae tunnels and clash with the Vanderbilt mercenaries, fighting your way deep underground to an ancient Tenebrae tomb.The Tenebrae TunnelsSide with Victor and the Vanderbilts, go to war against Mendel and the Veneficus mages, and help the mercenaries infiltrate the old tomb before the wizards do.Sanctuary of Sama'ElHelp the Veneficus mages fight their way through the Tenebrae tomb, but when they make a final, desperate decision, whose side will you choose?Sepulchre of Sama'ElContinue your adventure with the Vanderbilts, as you attempt to save the ancient tomb from destruction while facing a powerful ally… or a deadly adversary, depending on your decisions. Desert Storm: Team DeathmatchReturn to the endless desert and duke it out against other players or desert monsters in the largest Team Deathmatch map in Antaloor's history, four times bigger than any other multiplayer map! system requirements Windows - MinimumOS: Windows 7, 8, 8.1, 10Processor: Intel or AMD Single-Core Prozessor (2,0 GHz) or betterRAM: 2 GB or moreGraphics card: Radeon HD, Geforce 8800GT (Shader 3.0 and 512 MB RAM)	DirectX®: DirectX 9.0c or OpenGLHDD: 8 GB Sound card: DirectX comp. Stereo Sound CardAdditional Notes: Internet connection with 6.000 BPS or more for Multiplayer recommended© 1999-2018 by TopWare Interactive ACE. Developed by Reality Pump Game Development Studios.Two Worlds II, Reality Pump, TopWare Interactive and TopWare are registered trademarks of TopWare Interactive - AC Enterprises eK.